Multifunction copiers solve a huge challenge for businesses. If you think about it, business processes run on documents. From paper-based information to digital files that live on computers or in the cloud, documents are the lifeblood of any organization. Moving documents between paper and digital formats presents a challenge for many companies. 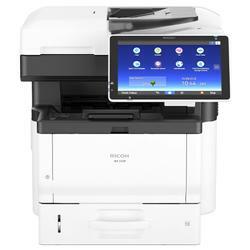 Multifunction systems that print, copy, scan, and fax allow you to move information between paper and digital format, enhancing your productivity. When it comes time to print information you expect your paper documents to be as easy to read as they are on a computer screen. Affordable color printing allows you to print full color documents at the same productive speeds you’ve come to expect from black and white printing. Your team can stop wasting time sorting, stapling, and hole punching documents. With full finishing options your copies and prints are sorted, stapled, and hole punched. You can even make folded and saddle-stitched booklets and insert cover sheets or tabs. Protecting personally identifiable information (PII) is mandatory in many industries. User authentication, encrypted hard drives, and many other protocols ensure that your information is secure throughout the printing, copying, faxing, and scanning process. Interested in learning how your company could benefit from multifunction systems? The team of professionals at Repeat Business Systems is ready to help you select the right technology from your company. We’ll customize the systems to your business, integrate with your network, and train your staff to ensure rapid adoption. Contact us today at info@rbsalbany.com to learn more.